The first image I want you to see is just the Capitol Christmas Tree by itself. I have done some cloning on this photo through Photoshop...but all of the other images are as originally taken. Even though the temperature was freezing, it was an experience I will never forget. And I sincerely hope that you enjoyed reading my story and viewing the photos of the Capitol Christmas Tree Cutting Ceremony. Please revisit my website from time to time...better still, come to our beautiful Stanislaus National Forest and spend some time touring on your own. On November 5th a group of news media, dignitaries, Forest Service employees and some invited guests gathered together at the Summit Ranger Station located in the Stanislaus National Forest on Highway 108 at 6 a.m. to drive to an unknown destination to witness the Capitol Christmas Tree Cutting Ceremony for 2011. For those of you who are not familiar with the roads along Highway 108, the chosen tree was located on the Clarks Fork Road which veers to the left just before beginning the initial climb toward Kennedy Meadows. Normally, it only takes about 30 minutes to reach this road from the Summit Ranger Station. 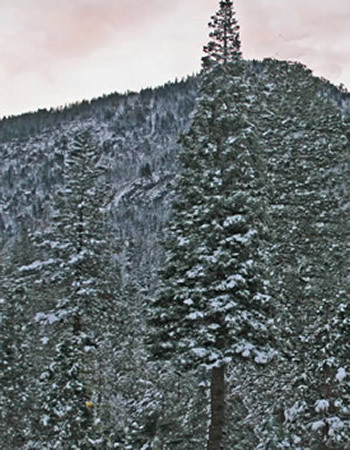 Two days prior to this historic event, the Stanislaus National Forest had their second snowfall of the season and with it came very cold temperatures averaging lows of around 17 degrees. But let's get back to the Capitol Tree. It took us about 40 minutes to reach Clarks Fork Road from the Summit Ranger Station. We crossed two small bridges and parked just after the second bridge at Forest Road 6N06 which is about 0.9 miles from Highway 108. We were shuttled via a Forest Service van for approximately one mile. Jim Junette, the coordinator for the entire event, is to be applauded for a wonderful job in arranging everything down to the last detail. There was a campfire which was a welcome sight since the temperature was in the high teens. Coffee was waiting for us and as well as dozens of delicious pastries. After warming up a little, we proceeded to the 'chosen tree' by walking along the road...icy in some spots...and finally got our first glimpse of the tree that had become such a topic of conversation. All of the trees were laden with snow...truly a 'Winter Wonderland'. 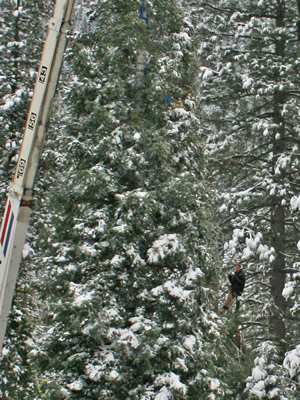 My goal for being present at the cutting of the Capitol Christmas Tree was to give everyone who reads my website the opportunity to enjoy this great event that occurred in our Stanislaus National Forest. It was a welcome sight to see the campfire and the delicious pastries donated by Alicia's Sugar Shack (located in Sugar Pine). The Forest Service provided coffee for all of us. Everyone was taking advantage of the campfire to get a little warmth. I heard later that the temperature was in the teens...believe me, it was freezing! We rounded a bend in the road and came upon the truck that was to carry the tree from the Stanislaus National Forest to 24 cities making a stop at those destinations before arriving in Washington D.C.
We climbed a gentle slope to the left of the road and for the first time gazed upon the beautiful white fir that was chosen to be The Capitol Christmas Tree. There were two cranes in position to help with the tree cutting and lowering of the tree onto the cradle of the truck. Carlos Geisdorff of the Tuolumne Band of Me-Wuk Indians, blessed the tree. He is the cultural coordinator of the tribe. He was joined by other members of the tribe. The California Flag was raised above the tree. The American Flag was raised as well. Oh Beautiful for Spacious Skies . . .What an impressive sight. After the flag raising, the group sang a song in their native tongue. We had all arrived at the location shortly after 7 in the morning and the tree cutting had been scheduled for 8 a.m. For our safety we were asked to remain behind the plastic fencing. There was a delay as Mark Patton, who was the tree cutter made some final changes regarding how the cranes would support the tree. This added another hour to the timeframe. As you can see, we all stood around waiting in the frigid early morning. There was lots of conversation as everyone was anticipating the tree cutting. It had snowed on Thursday night and there was perhaps four or five inches of snow on the ground. I estimate that there were somewhere between fifty to sixty people at the site. Finally the cranes came alive and the first job at hand was to lower the flags. The California State flag was the first to be lowered. It was such a beautiful scene watching the flag being lowered with a backdrop of snow still flocked on all the trees of the forest. Then the crane operators were ready. Mark Patton had volunteered to cut the tree...he is the owner of Tamarack Tree Service in Mi-wuk Village. How far up the tree will he go? The answer is in the next photo. This is as far as he can go! Would you like to be up there? I changed to my zoom lens at this point...Mark was attaching the riggings to the tree. At some point while he was up in the tree, he called out to all of us ... "Merry Christmas"! Mark's helmet had a camera attached and here he is taking images from way up the tree. Looks kind of scary to me...would you like to be in his shoes? We had been watching Mark working in the tree for what seemed like an eternity when he yelled out "Are You Ready?". Mark then lowered himself down to where the trunk is visible...he was ready to cut! If you look closely, you will see the chain saw in his hands...only a matter of minutes and the tree was separated from its base. Mark tells the crane operators below that it's now up to them! Look closely and you can see the tree is slowly being moved from away from the base toward the right. Just look what is directly above Mark's head! He certainly put trust in the crane operators! Very slowly the cranes lowered the tree to the ground. It was an amazing show for all of us. Mark watched as the tree was lowered and once again, he has his helmet in hand taking a video or still images. Mark must have had a great feeling of accomplishment for the successful cutting of the Capitol Christmas Tree. Very carefully the crane operators lowered the tree in preparation to set it on the truck. I understand that all of the men donated their services. They are all to be commended. Finally the tree was parallel to Clarks Fork Road and the truck...all they had to do now was move it forward and line it up with the cradle on the truck. That is easier said than done. They had to be so careful not to break the branches...the crane operators took their time...moving the tree forward and lowering, then raising it...until the tree was positioned just right. It was an exciting experience to watch how this large tree was being lowered onto the cradle of the truck. Here you can see one of the crew members pulling on a rope that was attached to the trunk and carefully guiding the tree to its final resting place. Notice the design on this side of the cab...and there were antlers painted above the windshield on the front of the cab. The other side of the truck has a custom design as well. You will see that shortly. There were still people standing around watching the project coming to an end. The Capitol Christmas Tree is almost ready to depart from its long life in the Stanislaus National Forest. As the Capitol Tree leaves Clarks Fork Road, here are some of the landscapes that were seen by all of us who experienced a special morning on November 5, 2011. We were back on Highway 108...destination...Sonora. The Stanislaus National Forest is a very special place. If you have never been here, come visit! The California Highway Patrol escorted the truck carrying the 'Capitol Christmas Tree' out of the Stanislaus National Forest. The red lights were flashing and the siren was blaring letting all know that a 'special cargo' was passing by. It was very exciting! This special tree grew for many years within our beautiful forest...now it is destined for a trip throughout many states...including 24 stops...before it arrives in Washington, D.C. It will be decorated with thousands of ornaments handmade by residents of the state of California. The tree will be lit on December 6, 2011 by House Speaker John Boehner and Johnny Crawford, a 7-year old boy from Sonora.... Johnny won the honor through a drawing entered by hundreds of California children. The Capitol Tree has now officially departed from the Stanislaus National Forest. As mentioned earlier, the panel on this side of the truck shows the 24 cities through which the Capitol Tree will be on display. My story ends here...since my website takes place only within this wonderful Forest. We wish Duane Brusseau of San Jose, CA (the driver of the truck) a safe journey. This will be a trip he will remember forever and so will we! Bole Weight: 6889 (The part of the tree between the ground and the first branches). Crown Weight: 1411 (From the first branch to the top). *It is interesting that when driving east on Highway 108, the road sign for Clarks Fork Road says just that, 'Clarks Fork Road' but when driving west on the Highway, the sign reads 'Clark Fork Road'. The trail at the end of the road is named 'Clark Fork Trail'.